Make your next gift to a die-hard Cards fan epic with our Personalized Locker Room Framed Wall Art from PersonalizedThings by Exposures. 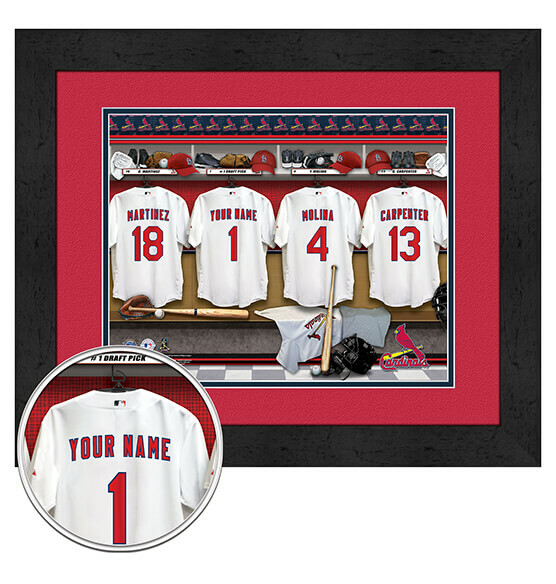 This customizable locker room scene features the name you choose to be added to the back of a Redbirds jersey — right there with some of the team's greats! Represent "The Lou" well with this memorable St. Louis Cardinals gift that will be cherished forever. It features a double digital mat in team colors, a high-quality black frame and comes ready to hang with a sawtooth hanger. This look-great-anywhere piece is a guaranteed four-bagger!